Hey everyone. Not sure how active this board may be, but I found the itch to play again and have been working on a few different roms. My first complete is an NHL 87 based on the 87-88 season. A lot of the players existed on NHL93 so it wasnt too many changes, so I was able to copy paste a lot. I made some tweaks to their ratings to the player they were 5 seasons earlier. Pretty pleased with my North Stars, Kings, Devils and Canucks jersey edits too. Touched up some teams like Philly, St Louis and Pittsburgh. If anyone is interested in seeing it I'll post the file. Or else Im talking to myself! Yes, post it, we are always interested in new roms. Also, can someone explain to me how to edit the team matchup screen in plain english? 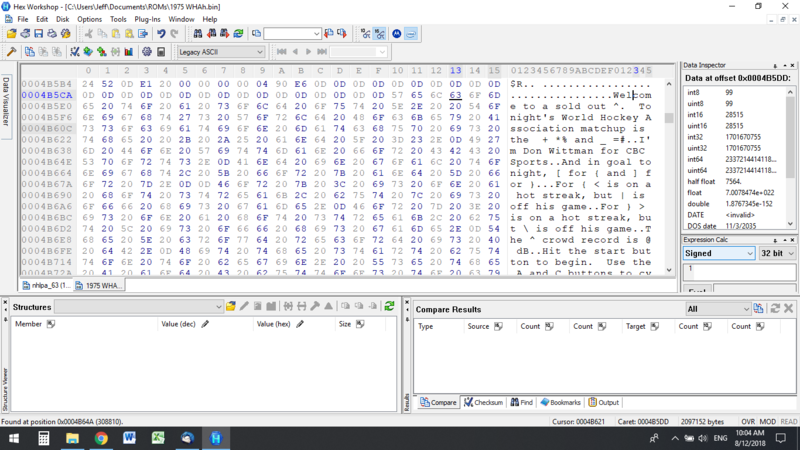 I know it needs the hex editor but I dont know where to begin there. Are you referring to the opening screen? Use NOSE - can be easily changed in the "Menu" tab. No, I mean the Ron Barr screen. I use HEX Workshop. Load the ROM then scroll through in the editor until you find the text you're looking to edit. Every action has a potentially ROM-wrecking reaction so I'm very careful to only overwrite existing text with the exact number of characters of new text. I've only use d it for '94 edits but I suspect that it's very similar.